In this post, we’ll recap how search engine marketing has shifted over the past couple of years and why many are making the move toward long form content in the form of pillar content. We’ll also discuss what the topic cluster model is, how to create topic clusters, how to use the HubSpot content strategy tool, why you need pillar content, and a couple of examples of pillar pages. Most marketers know that it can be difficult to keep up with Google’s search algorithm – there never seems to be a sure-fire way to rank. You can follow best practices and optimize your website to the best of your ability, but at the end of the day, some pages will rank on page 1 or 2, while others will show up on page 6. However, as Google (and other search engines) are constantly working to stay a step ahead of how people are searching, many marketers are finding that topic clusters are an effective way to offer high-quality content that ranks well. Not only are more people using their mobile devices for search, they're not even be typing their searches. More people are using voice search, which means searches tend to be more conversational – they aren’t simply entering a couple of keywords, but rather full sentences and questions. With this shift, comes the need for high quality search results, which is often measured by how much content is on the web page as well as how relevant the page appears to the search engine as it crawls the page. A couple of key indicators that long form content will help your company rank higher on Google, include these compelling stats about how content impacts SEO. As a result of all of the above, you might have seen the terms “topic clusters” or “pillar content” emerging on marketing blogs and articles. This new approach to strategy isn’t simply another way of creating your content strategy and SEO strategy – it’s reflective of how things have changed. As the way people search has shifted, this gave way to changes with content marketing strategy. Previously, strategy focused on keywords which are then turned into blog posts, which point visitors to landing pages. And now, content strategy is focused on developing several blog posts around a core topic that supports one of your company’s main products or services. By creating content this way, you’ll eventually be able to create a long-form resource, which will become a pillar page on your website. The four concepts you should understand for the topic cluster model include: topic clusters, core topics, subtopics, and pillar page. Topic clusters are made up of a core topic with several subtopics. Core topics should be a main subject that relates to your company’s products or services and can encompass 6-8 subtopics addressing specific questions your customers might have. Subtopics are blog posts you create around the keywords you identify that fall under the core topic. By creating several blog posts around one core topic, you'll have the content needed to create a pillar page. For example, Spot On chose to create our first pillar page on digital marketing strategy, which we’ll discuss more at the end of this article. As described, here is a breakdown of the steps it takes to create a pillar page. You can read about each of these in more detail here. This will require some research to determine which core topic and surrounding subtopics will be best for your strategy. It might help to think about some common questions potential customers have about your product or services and research from there. Find a core topic keyword with a search volume that’s at least 100 monthly searches (if not more) and subtopic keywords can vary, depending on how specific your industry is. Again, this will vary for everyone. Some businesses might find it reasonable to create one or two blog posts per week, while others can only produce a couple per month. Once you’ve established several blog posts, create an outline for how you want your pillar page content laid out – whether each blog post requires a chapter of its own or if a couple blogs can be combined for one chapter. Also consider how the information will flow as you create your outline. This part of the process can be tricky – you’ll need to summarize each blog post to create the pillar page content. Also make sure that you’re linking to each blog post within the pillar page. Before you send your pillar page copy for design, be sure to review, edit, and revise a few times to ensure that your content is complete and without error. Once you’ve completed step 5, send your content to design for the page itself as well as a downloadable PDF. Once your page is live, plan to promote your page through email and social media. Lastly, even though your pillar page has been published, that doesn’t mean your work is done. Make sure you update your content over time whether that means removing, adding, or revising. At INBOUND 2017, HubSpot announced its new content strategy tool. This tool allows marketers to create topic clusters focused on core topics related to a company’s products or services, with the subtopics serving as the topics for blog posts. The concept of pillar content existed prior to HubSpot creating their content strategy tool, so it would not be difficult to execute this strategy without it. However, utilizing this tool if you are able, makes the planning, organization, and execution much easier. Below you’ll see a couple of examples of how the tool looks – the core topic has a web of subtopics surrounding it. 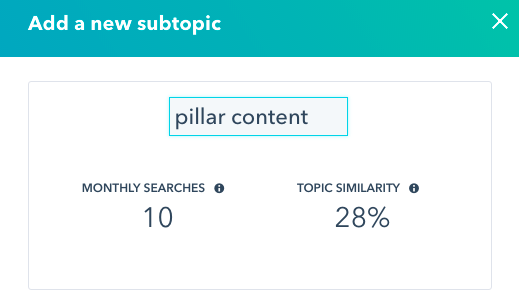 When you add a subtopic, you’ll be able to see monthly searches and topic similarity. Keep in mind this is only an example, so you’ll want to find subtopics with a higher similarity – closer to 70%. If you haven’t already gathered from this post – pillar content is becoming essential for the long term success of your content marketing strategy. First and foremost, topic clusters, and therefore, pillar content provide companies with an organized approach to their content strategy with a solid foundation of search engine optimization. 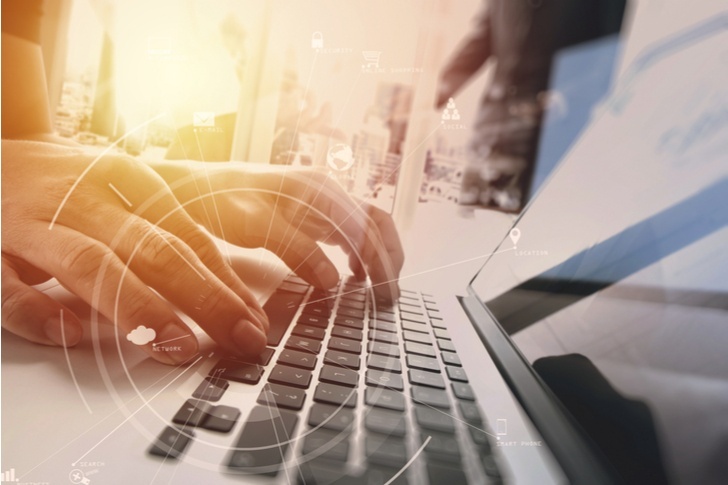 Aside from the benefits of search engine optimization (SEO), Inc. points out a couple of additional reasons – consumer behavior and thought leadership benefits. As far as consumer behavior, many are seeking more thorough information in the form of guides that they can reference on a regular basis. Pillar content provides people with a go-to resource that explores every question you can think of related to the main topic. While pillar content might not have a particular author, if it’s set up as a page on your company’s website, it will help your company to be seen as a thought leader on the topics you consider yourself an expert in. At this point, there are a number of examples of pillar pages out there, especially as more companies and marketers have adopted this approach to content strategy. To give you a better understanding of how topic clusters transform into pillar pages, here are a couple of examples. 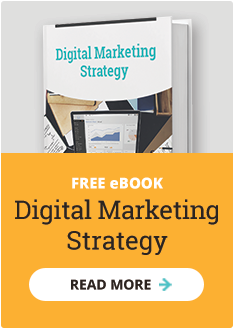 As Spot On began working to create the first pillar page for our website, we chose the core topic, ‘digital marketing strategy’ with the subsequent subtopics in several blog posts. Once we created all of the blog posts that we thought should be included under this topic, we developed an outline, and worked on creating copy for each blog post that would make up the content of the pillar page. As you can see below, this is our table of contents which encompasses all of the subtopics in our topic cluster. While HubSpot’s table of contents look a bit different than ours, their page presents the same concept. Covering Instagram Marketing, each of their subtopics cover a different aspect of marketing on Instagram. Take a look at the page here. What do you think? Are you ready to create a pillar page? If all of this sounds confusing or you simply don’t have the needed time to create your content – reach out to Spot On to discuss how we can help.